Rani Mukerji who recently tied the knot at 36. While she exchanged vows with filmmaker Aditya Chopra in Italy, her contemporaries like Tabu, Preity Zinta and Urmila Matondkar continue to be in the list of 30-plus yet single. In Bollywood an actress is written off after she gets married. So many actresses dread to get married even though they are in a relationship. This written off thing is not so true when it comes to actresses like Madhuri Dixit, Juhi Chawla. They may not be getting the main lead but for sidekick roles. This may be an important reason to ditch their personal life and they stay single. There are other Bollywood beauties like Priyanka Chopra and Amrita Rao who have also found a spot on the list. While Rani recently had a beautiful wedding in the Italian countryside, her cousin Tanishaa Mukerji, also 36, is still staying away from marital bliss. Kaho Naa... Pyaar Hai actress Ameesha Patel is also yet to get hitched. 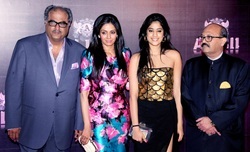 While most of Sridevi's leading men from Vinod Khanna to Anil Kapoor showed up at the celebratory party thrown at the lounge Alibi in Colaba (Mumbai) by politician Amar Singh and Sridevi's husband Boney Kapoor; Bollywood Actors Salman Khan and Shah Rukh Khan who were supposed to 'most certainly' be there did a no-show. And the reason was not their mutual hostility. Their reason for not turning up for Sri devi's Birthday Party was quite different. According to a very reliable source, "Salman and Shah Rukh were both aware of each other's invitation at the party. They didn't mind coming face to face. They didn't show up for entirely different reasons. Salman was all dressed and ready to leave for the party when he heard that the party had been organized by his one-time friend Bunty Walia. He immediately changed his mind." Shah Rukh was apparently all dressed and ready to arrive at the venue at 12 midnight. For reasons best known to him, he changed his mind. These Khan superstars' no-show apart, Sridevi's party was a grand success. All her Bollywood Actress colleagues like Hema Malini, Juhi Chawla, Sushmita Sen, Shilpa Shetty and her co-stars Randhir Kapoor, Rishi Kapoor to Vinod Khanna to Anil Kapoor (with wife Sunita) had turned up. Tennis champ Mahesh Bhupati with wife Lara Dutta rubbed shoulders with media baron Subhash Chandra. The political brigade was represented by such heavyweights as Praful Patel and Salman Khurshid. Says a prominent guest, "Boney's son Arjun was also supposed to be at the part. But Arjun is shooting in Chennai for 2 States got delayed because of rains and he couldn't make it. Boney's sister (whose son is being launched by Akshay Kumar) couldn't make it at the last minute because of a medical emergency in the family. However, Sanjay Kapoor and his wife Maheep were present." Says a VIP invitee, "It went on until 3.30 am. I'd say the highlight was the 7-minute show-reel on Sridevi that Amar Singh had gotten made. It traced Sridevi's career from a child artiste to the most recent cover-shoot for Vogue magazine." Has Salman Khan Lost Interest in Julia Vantur? Salman Khan’s love life is no news to B-town. Months after his relationship with Bollywood beauty Bollywood Actress Katrina Kaif ended for over some unknown reasons, Salman started seeing a Romanian TV anchor named Iulia Vantur. There was a strong buzz that Salman is very serious about his new Romanian girlfriend, and would marry her soon. But then came a twist in the tale! Our birdie, on the condition of anonymity informed us that the Dabanng dude is single again and has ended his alleged romance with Iulia Vantur. Wait, there is some more. The reason for their break up is apparently Salman’s parents. If the reports are to be believed, Iulia apparently is married to Grammy nominated Marius Moga. When she was confronted about it, she kept denying the allegations. That was when Salman’s family decided to step in and take charge of the situation. As more and more information about Iulia’s past started to emerge, the Khan family decided it was best that the couple parted ways. Apparently, Salman who was facing problems in getting a visa for London finally got it but he stayed back in the city to celebrate Eid and to sort this matter out with his family. But it seems that Salman failed to convince his parents. Now on one hand where Salman is alone and single again, Iulia is believed to have packed her bags and gone back to Romania. Firstly, his much-awaited action film Once Upon A Time In Mumbai Dobaara which also stars Bollywood Actresses Sonakshi Sinha and Imran Khan will hit the screens. And along with the film, the first teaser of Boss starring Akki in lead along with Aditi Rao Hydari will also be unveiled. What’s interesting is the fact that this is the first time ever that a teaser of the film is being launched to announce the trailer release. Now along with OUATIMD, we will look forward to catch the teaser of the khiladi’s new film too!